What a day. It began with a BNP (remember was 2200 yesterday) of 4100!!! AHHHHH! We were all VERY VERY thankful they’d made the decision to bring her to the ICU and do cath this morning. Heart cath and bioposy results are in. I’ve talked to mulitiple cardiologists. And we have some really really GOOD news and some really really BAD news. They are as certain as they can be that she is NOT in heart rejection. YEAHHH!!!!! Her biopsy came back negative, and even though those are prone to have false negative results, the heart cath didn’t support it being “rejection” either, for a number of reasons, but one because it is only the left ventricle that has depressed function. The right ventricle is pretty as can be. We are scheduled for another open heart surgery tomorrow. They may put it off till Friday or Monday, but we are on the schedule for tomorrow at the moment. I had hoped, prayed, that her transplant would be the last open heart surgery she’d have to go through. Actually, I’d hoped it was the last surgery, but then we had her diaphragm thing so that blew that one. This is really really hard to explain what is going on with her heart, but I’m going to try my best. The one thing I WILL note is that none of the doctor’s here have ever seen this before. Our cardiologist said that all transplant babies usually throw her one curve ball that is she hasn’t seen before. So this is Annabelle’s “one thing” and she’s not allowed to have any more!!!!! Focusing on the “aorta”, you then have smaller arteries that come off of those that continue the bloods path throughout your body, then you have even smaller veins that branch out even farther. One of the smaller arteries are called coronary arteries. They provide blood to your actual heart muscle. (This is different than the blood that pumps THROUGH the heart.) You need this to provide nutrients (i.e. oxygen) to your heart muscle, otherwise that muscle dies. The coronary artery going to the right side of her heart is fabulous. It is wide and open and without issue. Consequently, the right side of her heart is fabulous, pumping well with no weakening at all. However, the coronary artery going to the LEFT side of her heart has a spot that is narrowed and arched a bit. They believe this was with the original heart, and not something that developed over time. During the heart cath, it still showed blood moving through the narrowed spot, so initially when they gave cath results, they felt that this shouldn’t be causing the problem. People may have this normally and there is no issue at all. Her left ventricle, though, is the one having issues. It has increasingly gotten worse in function, thus causing the rise in her BNP. The other thing they saw in the cath lab is that the LPA is very narrow. Blood is still flowing through it to the left lung, and the pressures weren’t as bad as they thought they would be, but they could not balloon it because the WHOLE LPA is narrow. Not something they would necessarily fix by itself, though. So, a bunch of the cardiologists got together this afternoon along with the heart surgeon to try and figure out what in the world could be causing her decreased left ventricle function, if it wasn’t caused by rejection. They kept going back to the coronary artery narrowing. The thinking is, blood was flowing through it during the cath because she was under anesthesia and was very calm. However, they believe that when she is working to breathe, or when she is mad, that the pulmonary artery is pressing down on it, causing no blood to flow to the left ventricle, thus depleting her function. But…. there is no test to do to say definitively that this is what is happening. And it doesn’t necessary solve our problem as to why she was on oxygen. AND… this is not a problem they have ever seen before (at least here.) So it’s a little tricky when it is pretty much an equivalent of an educated guess. However, it is the only thing they can find that is a plausable explanation. Right now, we are scheduled for open heart surgery tomorrow. This may be changed to Friday, or the latest Monday, depending on her heart function. It is a delicate balance, we don’t want her to get worse, but if we can keep her calm and get her function better before surgery, that helps the outcome of the surgery too. They may also fix her narrow LPA while they are in there too, which I am an advocate of, because I really think the two together are causing her oxygen issues, or at the very least not helping it at all. Sorry for the long, long explanation, but writing it out and having to explain it actually helps ME understand it more. Thank you so much for your prayers today! It was a hard day, but God got us through, and we felt every one of your prayers! Remember Annabelle’s vocal chord issue? I don’t think I’ve specifically noted it, but I think it is GONE. The issue that is. She yells with the best of them now! It was gradual, over a week or two a month ago, but now she can express her opinions quiet well again! I’m just really praying, now that she has her voice back, that she can KEEP it this time! With each open heart surgery you have the possibility of damaging the nerves to both her diaphragm and her vocal chord, so I’m just praying really hard that they are preserved and not damaged at ALL this time. Obviously, this is very secondary to her surgery being successful though. Only picture I have today. Forgot to take one pre-cath with everything going on. My poor sleepy baby!!! She’s SO SO SO tuckered out from everything! Although… at least that means she is resting, which is GOOD for her heart right now! Will update in the morning as to status of surgery, if we are on or going to put it off another day. THANKS again for your prayers!!!!! Praying! I know this has gotta be hard to know that Annabelle has to go through yet another surgery I'm praying for good outcome of the surgery and speedy recovery and hopefully it will fix all the problems. stay strong Krista! Praying, praying, praying! Praying for the surgery, the doctors, precious Annabelle, and both you & your husband. Praying! I will pray for her heart, diaphragm and vocal cords. For peace for you, for wisdom and discernment for her treatment team. Wow! That was a lot for you and Scott to take in today. Your brains must be on overload, and I can't begin to imagine how drained you must be physically and emotionally. Praying for the surgery and for stamina for you and Scott. You poor thing! I am praying for sweet Annabelle! So sorry, Krista, but will be praying for you and your family. Hugs to you all. I love you with the love of the Lord. (((HUGS)))) Praying for Annabelle, the doctors/nurses/staff, and for you and Scott. You know you have lots and lots of prayer warriors on your behalf and for little Annabelle. We love you!! Hang in there, no matter what tomorrow brings. I will praise God for the awesome news that she is not rejecting her new beautiful heart. However, I will pray for your families comfort, reassurance, encouragement and perseverance through yet another valley. Annabelle is such a beautiful little girl and my thoughts are with her and you oh so often. I will be on my knees in prayer for God's precious little child, that the surgery is successful and that her doctors have wisdom. May she remain comfortable and pain free! Praying for your sweet girl! Stay strong baby Annabelle! Will continue to pray for all of you. Don't worry about sharing details, it allows me to pray more specifically. My son, Simon, developed a kink in his aorta and had to have a repair done 2 days after his Norwood. Even though his chest was never actually closed during that time, I still consider that 2 separate surgeries. I will be praying for not only a very fast recovery this time but also that they repair ALL of the issues so she will go home to you happy and healthy. That she will be oxygen free, as well. I'm praying and following all of your posts. Thank you for keeping us updated. It helps a lot…makes us feel like we're almost there with you. MUCH love coming your way! 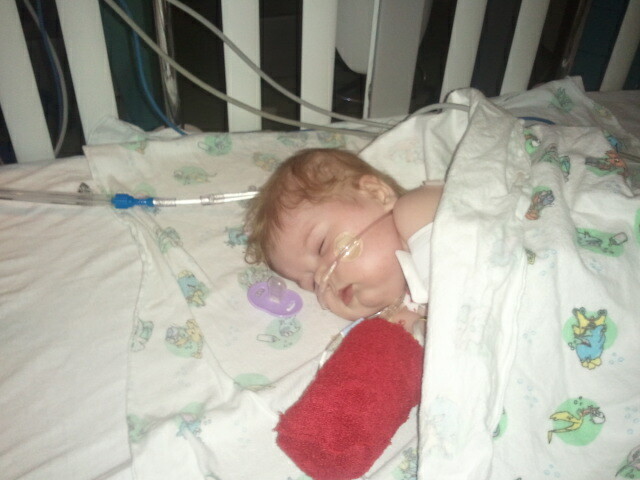 I am praying that God's hand will be on Annabelle and the doctors. Praying for answers and a solution. And praying for you.